One of my New Year's resolutions for 2019 is to get better at woodworking and share more of how I approach projects in the hope that it'll help someone out and encourage feedback that will make me a better designer. 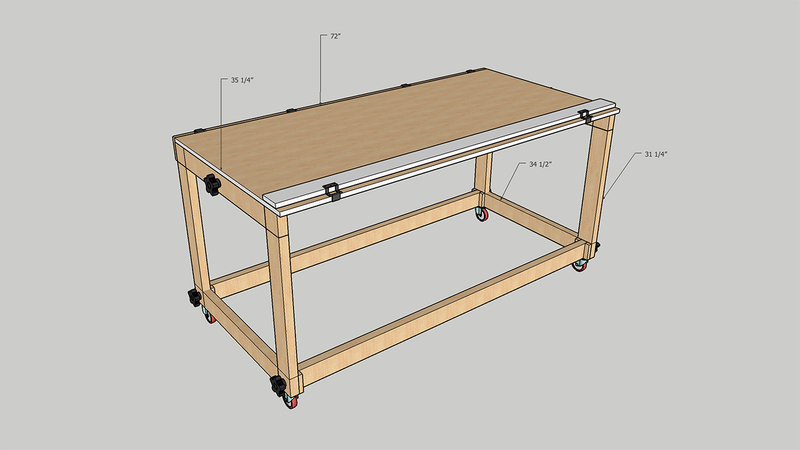 My first project of the year is this collapsible worktable / outfeed table that I designed and built in about three days. I have a very small storage space in a shared garage which I use as my workspace when my neighbors are out of town. Due to my space constraints, I needed a worktable that could easy collapse and store away when not in use. Inspiration for the design came from this youtube video which demonstrates the use of the 270 degree hinges that allow the top of the table to flip back behind the legs. This video gave me a great starting point from which to expand upon the design. I have much to learn in the space of woodworking and have many more projects in store now that I have a proper worktable to build them on. If you enjoy this project or use the design I would love to know.